The Lux isn’t just Canyon’s latest XC ripper – it’s also the lightest and most advanced full suspension race bike that the German brand has ever produced. 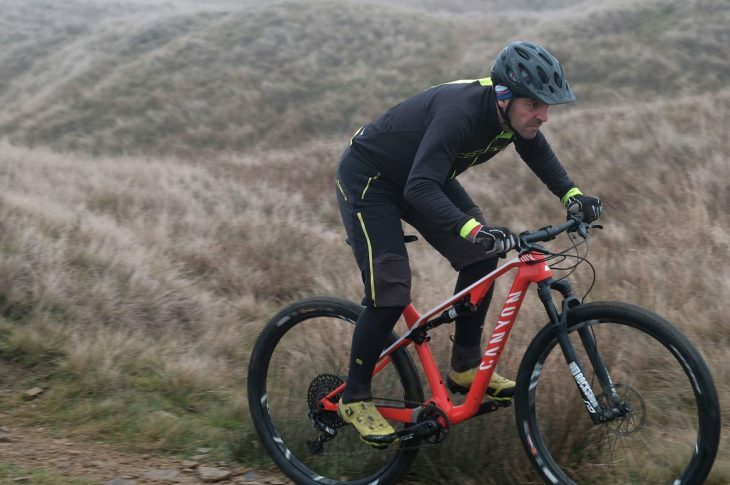 We put one into the hands of our tame XC/marathon masochist, Daz, to see if this German lightweight is ready for everything Yorkshire can throw at it. Over to Daz! I’ve never really been into fast or sporty cars, I’ve always been either too poor or too sensible to be tempted. As a kid though I remember drooling over anything that looked like it could go faster than the Nissan Sunny my dad owned. Back then you always knew, or were supposed to think a car was fast, because they were often painted racing red, and adorned with a white stripe down the side or the middle. I have no idea if Canyon had this in mind when designing the paint job on the new Lux, or maybe as suggested in our first look they were thinking about a certain 70s TV show? Either way, if subliminal advertising was the aim, then those of us of a certain age should be left in no doubt that this bike is intended for riding fast and somewhat recklessly. 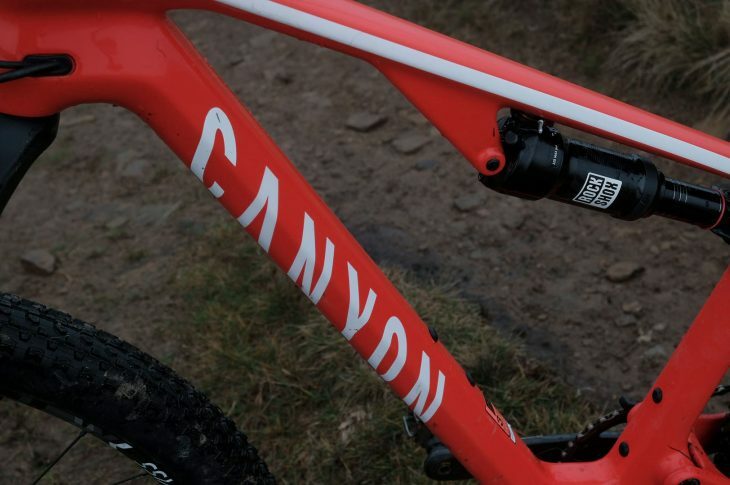 Released back in June, the is Canyon’s flagship full suspension race bike designed for World Cup XCO competition and marathon racing. As we’ll see though, with some tweaks it also does a good impression of a general purpose mile-muncher for mortals. With 100mm of rear travel and 29in wheels, the Lux comes in two flavours; the SL and SLX. Both feature full carbon frames, but the higher end SLX models are aimed at out-and-out racers and feature a lighter weight carbon layup, 100mm travel forks and the associated bling you’d expect of race bikes with price tags upwards of £5k. The SL models, whilst still firmly intended as race bikes, have more endurance friendly 110mm forks and more sensible components that see the complete bikes retail between £2,349 to £4,149. Go-fast stripes and a red paint job? The Lux is about as subtle as a sledgehammer. 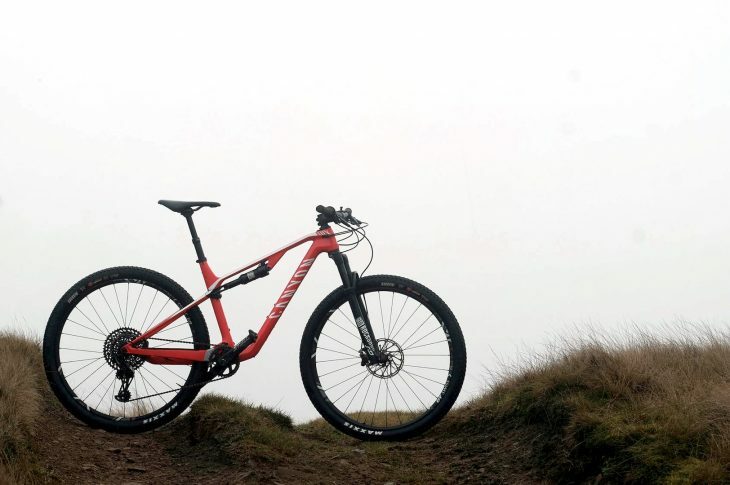 In this case, the SL 8.0 Pro Race retails at a very respectable £3,399 considering the inclusion of Rockshox SID RLC forks, an Eagle X01 groupset, Truvativ Style Carbon DUB crankset, DT Swiss XR1501 29in wheels, and a KS Lev dropper. 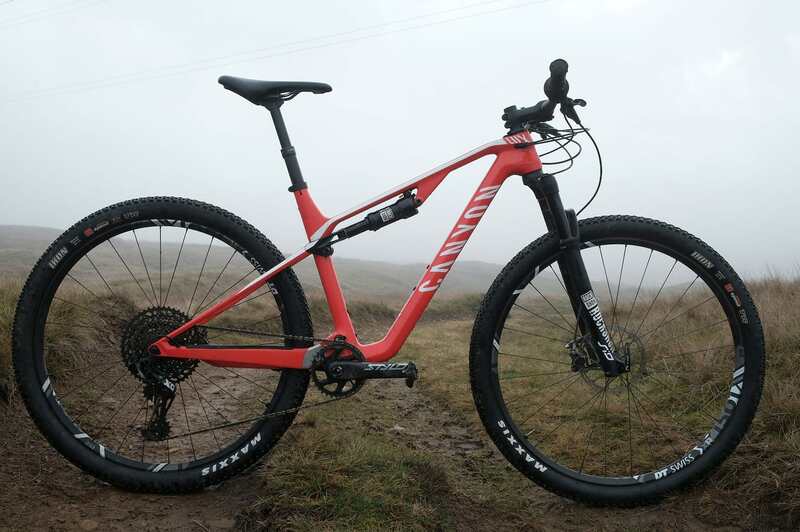 Compared to its competitors such as the Santa Cruz Blur and Scott Spark, you’ll save more than a few quid for a spec as good or better, which given Canyon’s direct sales model and price-slashing reputation is not a huge surprise. In his first ride review of the SLX 9.0, Wil was impressed with the speed and efficiency of the Lux, as well as its capability on more technical terrain. On the SL 8.0 I was interested in whether the extra 10mm of front suspension would provide extra capability on descents and comfort for longer endurance rides. 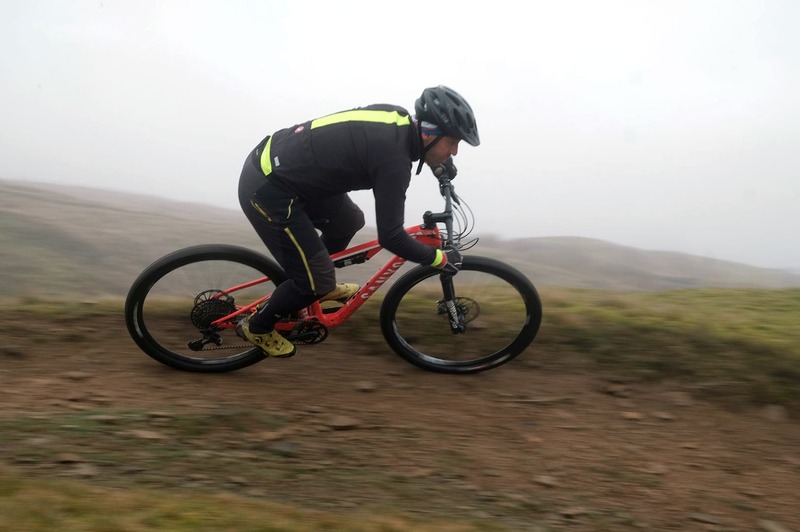 The World 24hr Solo champs in Fort William in October would be the perfect opportunity to test these aspects of the bike, along with a standard wet and muddy Calderdale autumn to test its durability and ability to handle more technical terrain. Canyon specs the Lux CF SL models with a 110mm travel fork and a dropper post. 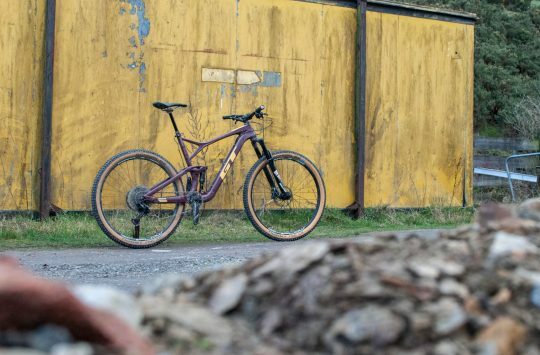 Back when this bike was first released in June, Wil did a forensic breakdown of the specs and features, which saves me a bit of effort in repeating it all. It’s worth pointing out however some of the highlights which catch the eye and withstood, or not, a five month thrashing. Aside from the striking paint job, one of the things that stands out on the Lux is its svelte appearance. The compact linkage setup in combination with the shock being tucked tightly under the top tube gives this bike an extremely slimline and efficient looking appearance. I don’t know if Canyon was trying to make this look like a hardtail, but if they were they’ve succeeded. 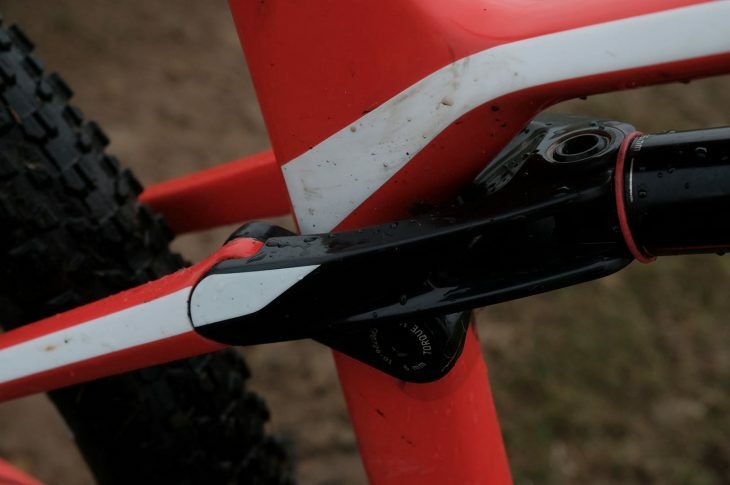 The pivot-less back end uses a direct-mount brake calliper to keep the seatstay nice and flexy. The new suspension setup has some more important functions other than making it look good. By shifting the shock from the previous vertical position in front of the seatube to below and parallel with the top tube, the frame can accommodate two large bottles thanks to the huge amount of space inside the front triangle. This will be a big attraction to the endurance or high-mileage rider. It doesn’t just look a bit like a hardtail either – the RockShox dual remote lockout turns it into one too. Of course it’s not unusual for race bikes to come with a remote lockout. As with other bikes I’ve ridden with this lockout, it works pretty much flawlessly, locking out both the front and rear suspension simultaneously either for instant sprint duties when you decide to drop the wheelsucker on your back wheel (as if! ), or for squeezing out every last watt on long sustained climbs. Despite the marketing tag of ‘Modern Race Geometry‘, the numbers suggest something a little more conservative. In fact when you compare to some other contemporary race bikes, Canyon has resisted the urge to go low and slack and have instead kept the angles fairly traditional. The bottom bracket has also been kept at a height where you’re not striking rocks with every other pedal stroke, which is a good thing in my opinion. 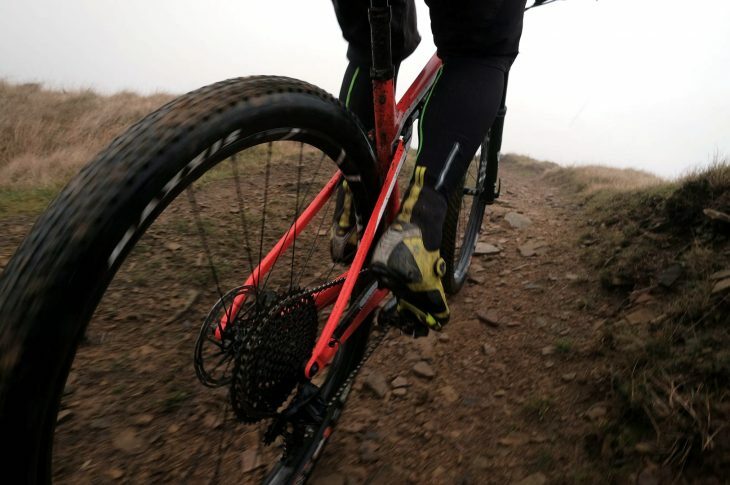 It’s all very well having a low centre of gravity, but the extra stability and manoeuvrability is for nothing if it increases the chances of pedal strikes that could cause a crash when descending on the edge or deprive you of much needed momentum on climbs. The Lux is 1x specific, and has the world’s cutest chainguide. Where the Lux differs from a lot competitors is the cockpit. 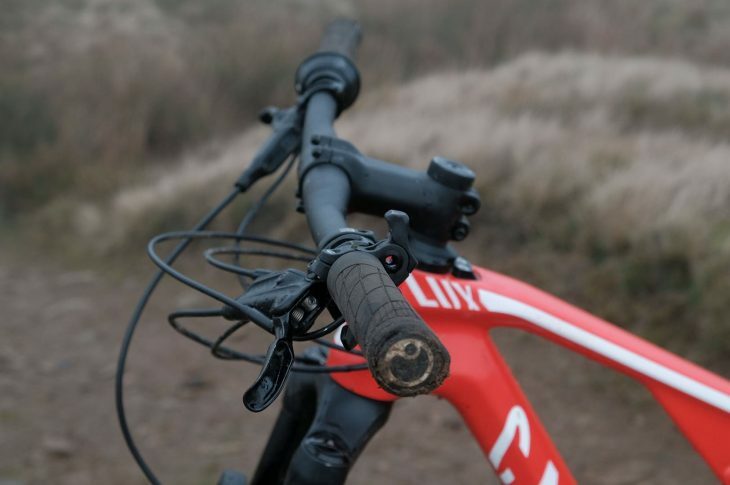 The 720mm bars and 80mm stem go against the modern trend for ever wider bars and shorter stems. In the grand scheme of things, the bars aren’t that narrow, but if you’re used to wider they will take a bit of getting used to. In combination with the stem, this results in somewhat twitchy steering, which is a little unnerving on fast straight descents but right at home on twisty race tracks. It also helps when overtaking in tight spaces, or rather in my case, being overtaken and not causing an unnecessary obstruction. 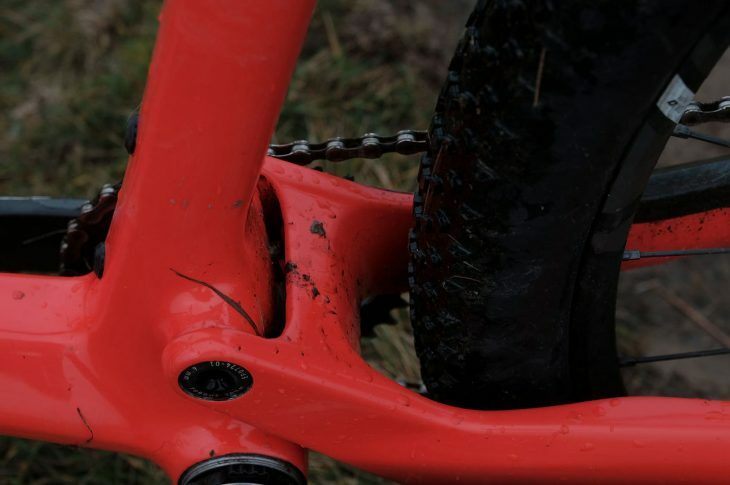 720mm bars in 2019? Too narrow for us. 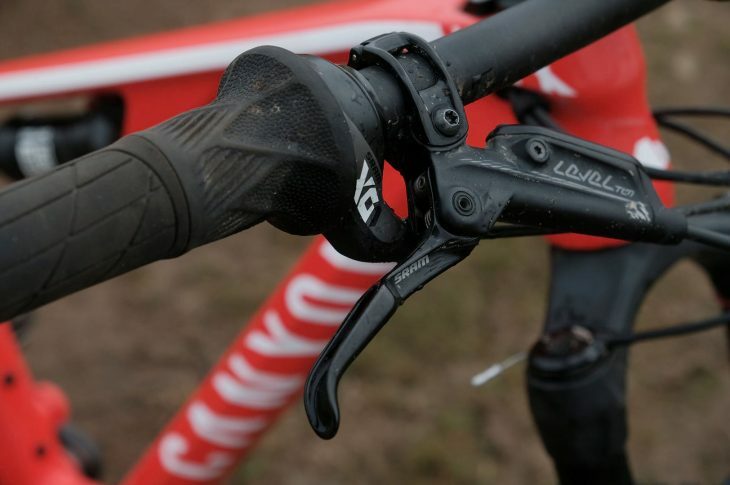 Another surprise in the cockpit area is the SRAM Eagle Gripshift. It’s been a long time since I saw a grip shifter, so this was the one element of the bike which I was most sceptical about. Grip shifts are for kids right? Wrong! Once I’d reprogrammed my brain to forget about using my right thumb for anything other than hanging on to the bars, this was something of a revelation. The ability to rattle all the way through a cassette in either direction with a flick of the wrist is something you never get tired of, and is a huge benefit when racing, especially long endurance races, helping to avoid the dreaded thumb cramp – a very real and uncomfortable thing. Grip Shift in 2019? Yes, please and thank you. The main downside to the grip shift is that it reduces the choice of grips available to use when you need to replace them. The Ergon grips that come with the bike are perfectly fine for all uses, and I survived most of the way through a 24 hour race with very little discomfort. If you’re picky on this front though then have a think. Even if you can’t acquire the grips you prefer in cut down twist-grip compatible form, then it might be feasible to cut some down yourself as long as they’re not of the locking variety. I often find when riding new bikes that I often don’t take to them immediately, and as a consequence suffer from the dreaded condition of buyers regret. Obviously that wasn’t a problem in this case, but as usual the Lux failed to get me very excited after the first couple of rides. Whilst this wasn’t a great surprise, I was scratching my head a little at the prospect of doing an extended test of a bike I may not like. Out of the blocks, the Lux accelerates with purpose. I’m no race whippet, and you’ll never find me in the front group of a race sprinting up the first climb [Ed – Erm, that isn’t entirely true Daz…]. I do however like to make up ground on the descents where possible. Add to this the fact that I launched this Lux down some of Calderdale’s faster descents on the first ride, I quickly learned that the twitchy steering was something I was going to have to get used to. That’s an understated way of saying it wasn’t just the steering that was twitching on the first ride. The other option was to make the steering less twitchy by installing some wider bars. As chance would have it I had some 780mm low rise bars lying around so thought I’d give it a go. I’ve always preferred the extra stability wider bars provide on fast descents, but this was quite a radical change in the way the bike handles. Almost instantly I went from hanging on and hoping, to thrashing down the same trails I had previously struggled on as if I was riding a trail bike. 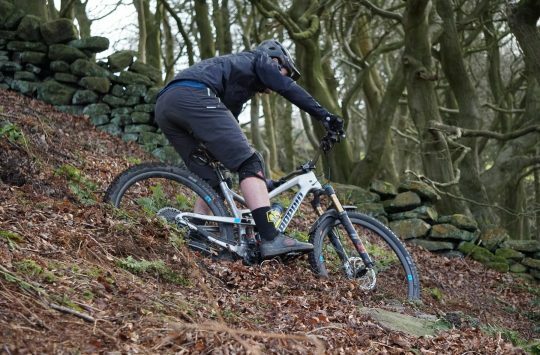 The flip side to this adaptation was that on the twisty singletrack you’d encounter on a typical racecourse, the steering was a little too vague. This could possibly be remedied with a slightly shorter stem to speed the steering back up a bit, but that would have upset the stretched out race position too much. In the end the solution was to simply put the miles in and re-train the motor neurons, but if this doesn’t work the wider bars option is always there if required. It’s twitchy in the ‘traditional XC race bike’ sense. Put wider bars on though, and things change considerably. It’s not all just about the cockpit though. The Triple Phase suspension provides the best of both worlds in terms of soaking up small bumps and trail buzz as well as handling bigger hits. 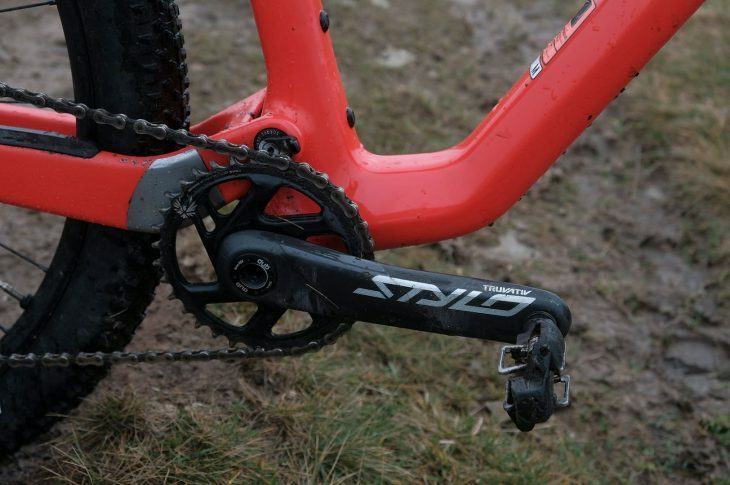 It also allows you to run more sag without worrying about bottoming out the shock. 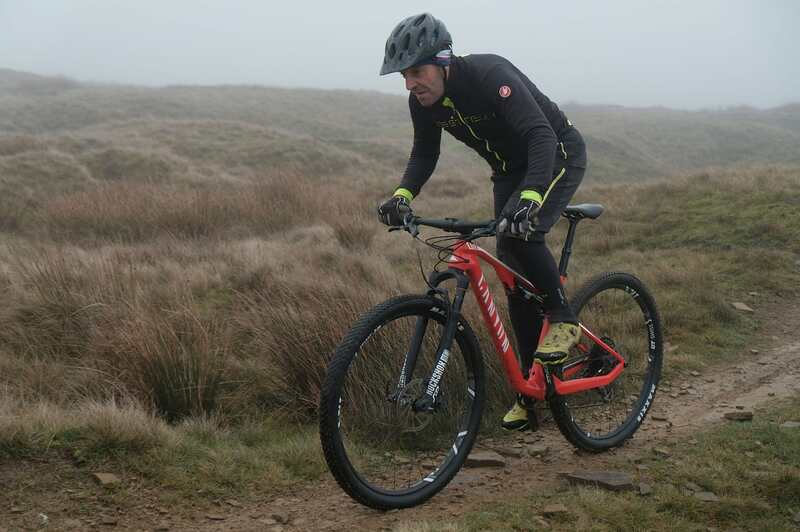 I have a long running bad habit of running shocks and forks too stiff, but I had the shock set at 30% sag which gave me almost 100% of the travel without any evidence of it bottoming out, even on some of the rockiest and gnarliest trails Calderdale has to offer. 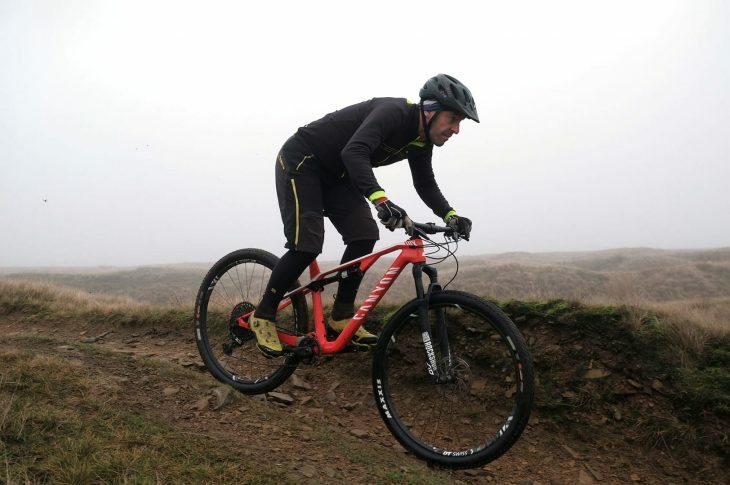 Once you’ve adapted to the shorter bars, the suspension, in combination with the light weight and the dropper, really allow you to throw it down descents with abandon. It will barrel through rock gardens, rail round corners and negotiate jumps and drops with a minimum of drama, enabling you to concentrate on other stuff like tactics, feeding strategies, and if you’re like me, how to prevent the riders behind from overtaking you en masse. 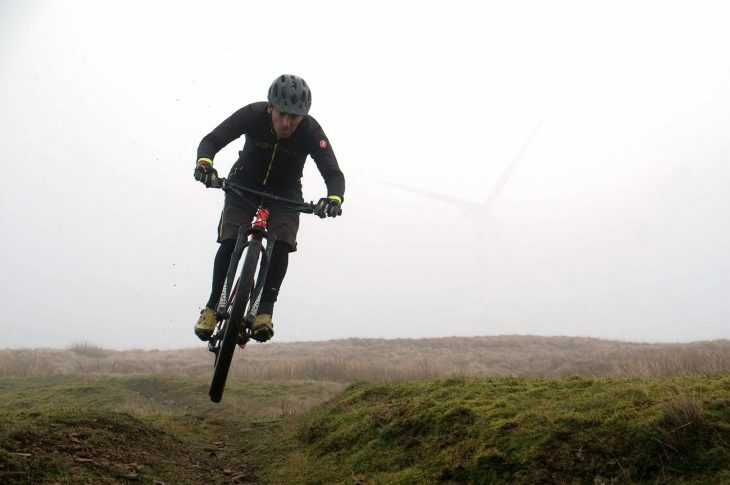 Daz jumping his way away from the mechanised wind farm monsters. The climbing performance also benefits from the suspension ramping up as you go through the travel. 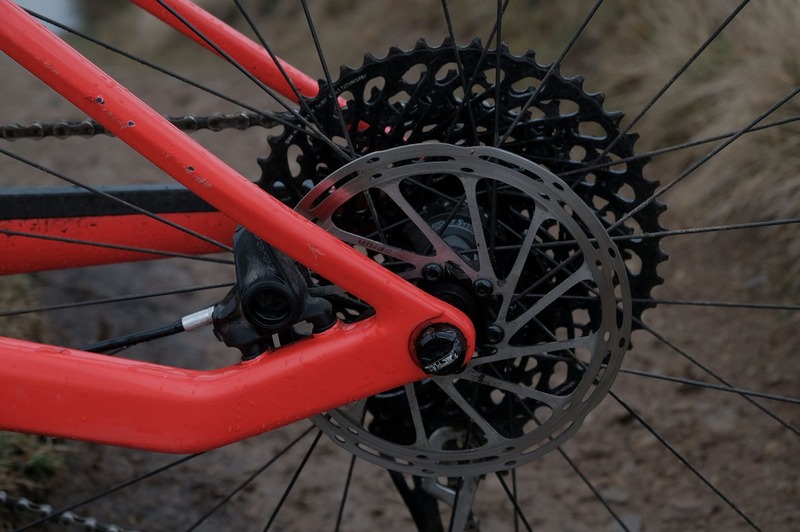 The first phase (up until the sag point) keeps the rear wheel stuck to the trail, while the middle phase (beyond the sag point) sees it stiffening up impressively when you put the power down. This results in smooth and efficient climbing on technical or rocky terrain, either in or out of the saddle. When the trail flattens out, I found the lockout is required to eliminate a small amount of pedal bob that exists in the plusher first part of the travel. 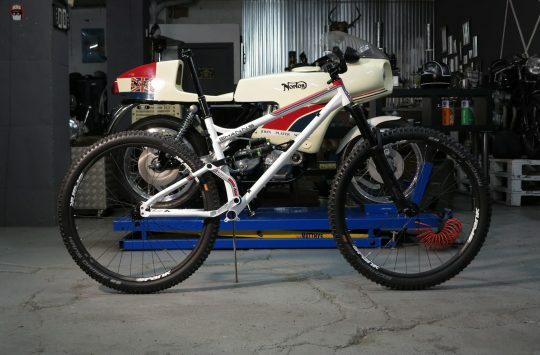 This isn’t a race bike where the suspension design renders the lockout redundant. This isn’t a disadvantage though, as there’s just enough give in the frame to provide a comfortable ride with the lockout engaged. So comfortable in fact that I found myself riding it locked out for the vast majority of the time when climbing or on the flat, using the suspension only for descending duties. Those super-thin seatstays provide useful seated comfort when the suspension is locked out. In addition to its descending and climbing pedigree, the Lux SL provides a level of comfort on endurance rides or races that other bikes I’ve ridden struggle to match. I’ve struggled with back problems in the past so it doesn’t take long to notice if a bike isn’t right. Not on the Lux though. Whether on a 24 hour race or all-day ride I’ve yet to experience any of the niggling aches and pains that have dogged me for the past few years, and I can assure you this isn’t down to regular core-strength and yoga sessions. The suspension clearly helps in this respect, but also the geometry, in particular the reach and the stack, provides an excellent platform for endurance riding, with a slightly more upright position provided by the 110mm forks and a nicely stretched out position as a result of the 80mm stem. At 175cm tall I’m often on the dividing line between medium and large sizes, but there’s no debate this time as the medium fits as well as any I’ve ridden. Despite being punished through a 24-hour race, both the Lux and Daz came out better than expected. In the five months of this test, the Lux has probably covered something like 1000km and 80 hours of riding, much of that in sub-optimal conditions. There is little evidence of that though in how the bike now performs. The linkage bearings and bushes are all solid, the bottom bracket and headset running freely, the wheels are true and there’s zero play in the hubs. I did wonder if the grip shifter would suffer from the ingress of dirt and grit but that too appears to be resistant to the elements. Unsurprisingly the forks need a service, with some stickiness in evidence. The main component to suffer has been the KS dropper. The LEV Si is a cheaper version of the regular LEV, and it features a non-serviceable air cartridge inside and a cheaper over-the-bar remote that isn’t as light in action compared to KS’s Southpaw remote. It still works, but over the test period the sliding action has become quite sticky and temperamental. A clean out and some fresh grease under the main seal perked it up a lot, so some regular TLC may be in order for those who frequently ride in wet conditions. Twist Grip Shifter. Actually not just for kids! The Lux may just be the perfect endurance machine. On reading the marketing blurb and looking at the spec for the Lux, you’d be forgiven for thinking that this is a very niche bike for a very niche purpose, attractive only to race whippets or MAMILs who haven’t yet jumped on the longer-lower-slacker bandwagon. And it is. However, the Lux CF SL 8.0 Pro Race is more than just a vanilla race bike. With comfortable geometry that doesn’t detract from the racing performance, this is perhaps the perfect endurance machine. It will certainly perform at a very high level on short course XC duties, and has all the bells and whistles of many of its peers at a more manageable price. Where it really comes in to its own though is in races or events that are longer than your average one or two hour vomit inducing, max-heart rate blast round a 4km course. 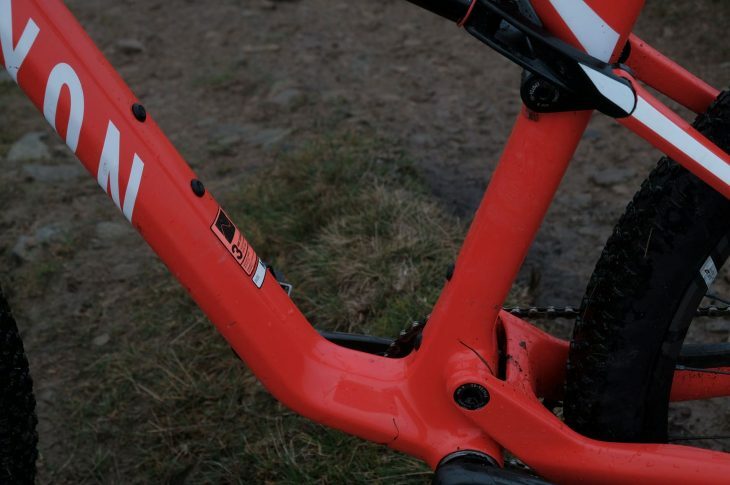 The longer the better in fact, preferably with long draggy climbs and recklessly fast or technical descents, where the extra comfort and stability of the 110mm fork comes into its own. Yep, the Lux is quick. And unlike many of the cars which originally sported them, it fully justifies the go-faster stripe. A race bike with creature comforts to make it all just a little less painful. I am logged in but the article says I need to log-in to view it??? Borked article. I’m logged in but can’t read it. Thanks Daz. Quick question: what does it weigh? This little lot is in the middle of the article.